Norfolk Island in the South Pacific is most notorious for it’s brutal penal settlement history. Perhaps because nearby Australia is so familiar with it’s own convict history, or perhaps because so many of the ruins of that period remain. However, the island really has five histories, and each has contributed culturally to Norfolk Island as it is today. Norfolk Island was originally settled by the Polynesians and the remains of a Polynesian settlement were excavated in the mid 1990s near Emily Bay revealing a house, a paved area, stone artefacts, shell and bone tools. Banana plantations were also discovered. Dating their time on the island has not been possible but significant Polynesian migration took place between 1,200 and 2,500 years ago, so it is believed they were there somewhere during that period. It is not known if the Polynesians died or moved on but they had abandoned Norfolk Island before the first European to spot Norfolk Island, Captain James Cook, turned up in 1774. Two convict settlements were established on the island with the remains of the second settlement visible today. Several historic ruins survive to tell the tale of those that occupied them. Prisoners in irons were put to work in the Crankmill as a form of punishment and the original hospital would have been a frightening place. Both stand in ruins in Kingston. A storehouse and officers’ houses, also in Kingston, have been restored and can be visited. The Governor’s residence looked impressive but we weren’t invited in! The island cemetery also told part of the island’s history, with many of the historic headstones providing information on the circumstances of the owner’s demise. One story I uncovered there was the murder of a settlement worker by some of the prisoners, who were later hanged and buried just outside the cemetery at what is now known as Murderers’ Mound. Many tombstones belonged to young people indicating the difficulties of life on the island at that time and there were several that mentioned drowning at sea. The penal settlement is just one chapter of the island’s life. 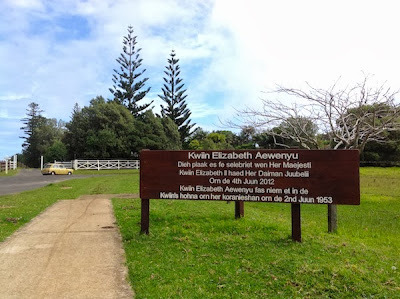 Following its closure the settlers of Pitcairn Island, who were descendents of the Bounty mutineers, relocated to Norfolk Island in 1856, bringing with them their Tahitian customs and language. The Pitkern language has evolved over time and the native language spoken on Norfolk Island is known as Norf’k. In 2007 the language was recognised by UNESCO as an endangered language and it is taught in the island school and used for place names. In 1866 a Melanesian Mission was founded on the island and by the 1890s accommodated two hundred young men and women that were instructed and then expected to return to their homes to share their new knowledge. The mission’s St Barnabas Chapel was built in the memory of Bishop Patteson, the first bishop of Melanesia. When the mission closed many of the buildings were relocated to the Solomon Islands. In the 1940s Norfolk Island’s isolation was useful in the Second World War. America provided materials and Australian, local and New Zealand labour built an airstrip on the island, which has subsequently proved to be a valuable piece of infrastructure for the island residents, and enabled tourism to be developed on the island. For such a small and isolated place, Norfolk Island can provide plenty to keep history buffs busy. Have you ever visited a place whose history surprised you? Please let me know in the comments below.